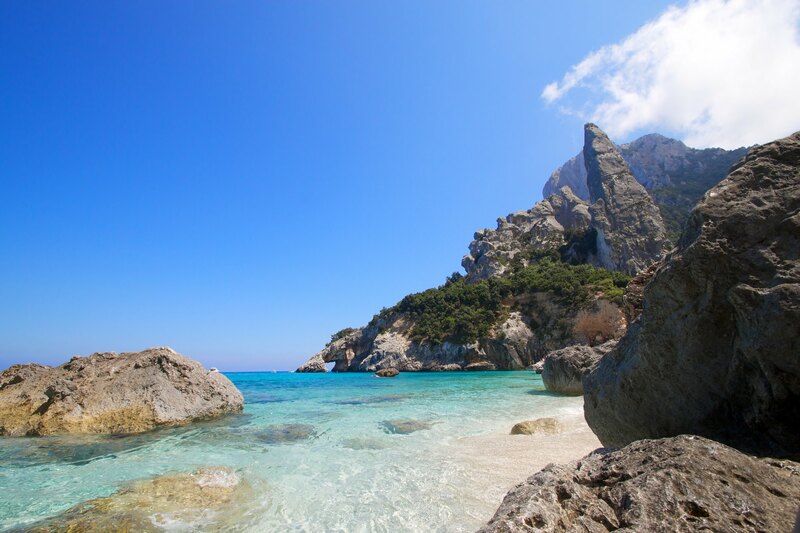 The Supramonte is an area of mountains and highlands located in central-eastern Sardinia, Italy. It lies northeast of the Gennargentu massif, spanning eastwards until it reaches the Tyrrhenian Sea in the Gulf of Orosei. 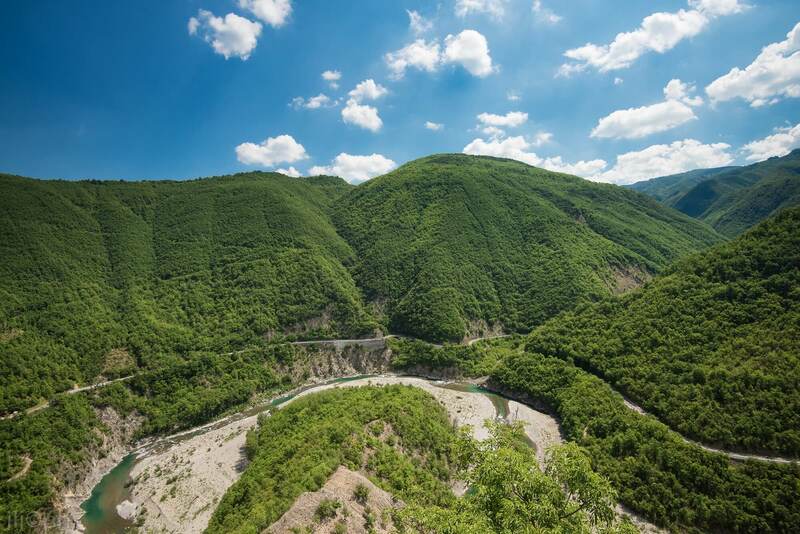 It has an extension of about 35,000 hectares, encompassing most of the territories of the comuni (municipalities) of Baunei, Dorgali, Oliena, Orgosolo, and Urzulei. However, the populated areas of these comuni actually lie at the borders of the Supramonte, which, for the most part, is in fact a largely uninhabited continuum of sharp limestone cliffs and deep, lush canyons. The highest peak is Monte Corrasi (1,463 m), while the average altitude is about 900 m. The Supramonte is characterized by Karstic highlands in which the rivers dug deep ravines and canyons. The rivers actually flow mostly underground, creating several caves, such as the Grotta del Bue Marino, the Grotta di Ispinigoli (with the highest column in Europe, measuring 38 m), and the caves of Sa Oche ("The Voice") and Su Bentu ("The Wind"), or springs, such as the spring of Su Gologone. Other notable places include the plain (campu) of Donanigoro, the sinkhole of Su Sercone, the deep ravine of Gorropu, and the Mesozoic limestone mountain of Monte Novo San Giovanni (1,316 m). The so-called "Supramonte Marino" ("Seaside Supramonte", to distinguish it from the inner "Supramonte Montano", "Mountain Supramonte") lies within the territories of Dorgali and Baunei, bordering the Gulf of Orosei and including several renowned beaches (Cala Luna, Cala Sisine, Cala Mariolu, Cala Goloritzé) often located at the end of deep valleys called codulas. In prehistoric times, the Supramonte area was more densely inhabited than it is today, as attested by the traces of at least 76 villages, 46 nuraghes, 14 dolmens, 40 Giants' graves, 17 holy wells, and 3 megalithic walls. Notable archeological sites include the village of Serra Orrios (although located slightly north of the northern border of the limestone lands), which counted about 70 circular huts and two megaron-like temples, and the nuraghe village of Tiscali, located in a strategic high position between the valleys of Lanaittu and Oddoene. Mount Etna (pronunciation: /ˈɛtnə/; Italian: Etna [ˈɛtna] or Mongibello, Sicilian: Mungibeddu or â Muntagna, Latin: Aetna) is an active stratovolcano on the east coast of Sicily, Italy, in the Province of Catania, between Messina and Catania. It lies above the convergent plate margin between the African Plate and the Eurasian Plate. It is the tallest active volcano in Europe, currently 3,329 m (10,922 ft) high, though this varies with summit eruptions. 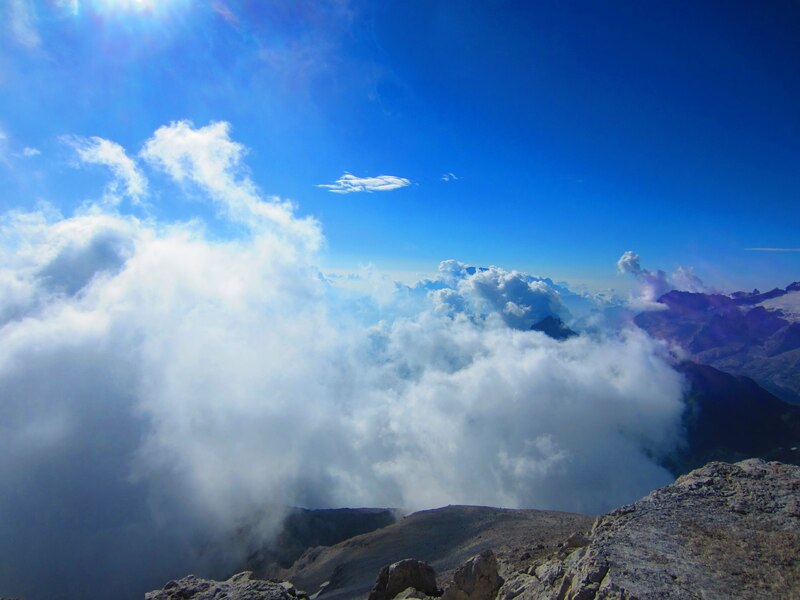 It is the highest mountain in Italy south of the Alps. 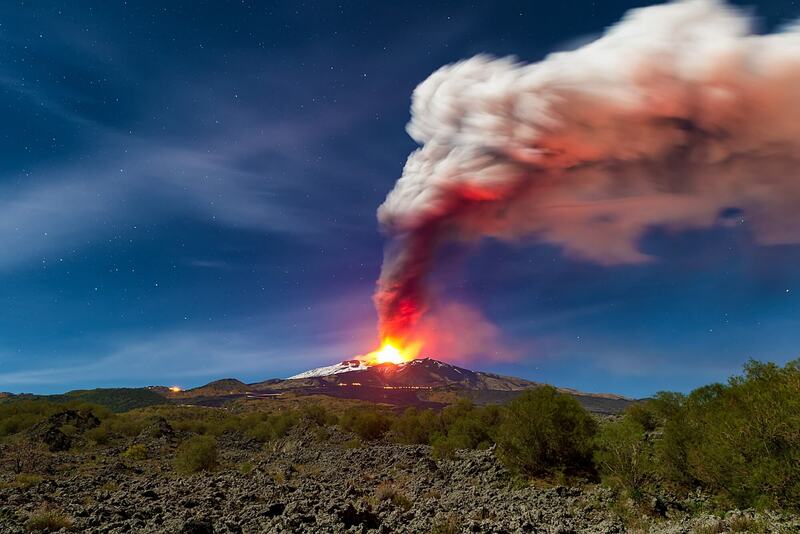 Etna covers an area of 1,190 km2 (459 sq mi) with a basal circumference of 140 km. This makes it by far the largest of the three active volcanoes in Italy, being about two and a half times the height of the next largest, Mount Vesuvius. Only Mount Teide in Tenerife surpasses it in the whole of the European–North-African region. In Greek Mythology, the deadly monster Typhon was trapped under this mountain by Zeus, the god of the sky and thunder and king of gods, and the forges of Hephaestus were said to also be located underneath it. According to Adrian Room’s book Place-names of the World, the name Etna originated from the Phoenician word attuna meaning "furnace" or "chimney". He dismisses the hypothesis that Etna is from the Greek αἴθω (aithō), meaning "I burn", through an iotacist pronunciation. In Classical Greek, it is called Αἴτνη (Aítnē), a name given also to Catania and the city originally known as Inessa, and in Latin it is called Aetna. In Arabic, it was called جبل النار Jabal al-Nār (the Mountain of Fire). The Trebbia (stressed Trèbbia; Latin: Trebia) is a river predominantly of Liguria and Emilia Romagna in northern Italy. It is one of the four main right-bank tributaries of the river Po, the other three being the Tanaro, the Secchia and the Panaro. The 1,150-square-kilometre (440 sq mi) drainage basin is divided among Emilia Romagna, 770 square kilometres (300 sq mi), Liguria, 349 square kilometres (135 sq mi), and Lombardy, 31 square kilometres (12 sq mi). Its principal tributaries are the torrents Aveto and Perino (from the right) and the torrent Boreca (from the left). The source of the river, the Trebbia river spring, is in the Ligurian Apennines on the south slopes of Monte Prelà, to the south of Monte Antola in the comune of Torriglia, Province of Genoa. Monte Prelà, 1,407 m (4,616 ft) high,[note 1] is part of the Antola massif. The spring is not on the peak but is at roughly 800 m (2,600 ft). Across a small ridge to the west, on which sits Torriglia, and slightly further downslope is the source of the Scrivia river. Over a ridge to the northeast is the Brugneto reservoir, water supply for Genoa. The reservoir was created in 1959 by damming Brugneto stream, which formerly joined its waters to the Trebbia, but now only does so when the reservoir is full. A ridge running north from Prelà connects to Monte Druso, then to Monte Cremado, and finally to Monte Antola at 1,597 m (5,240 ft). From its peak on a clear day can be seen Genoa, Corsica, the Tuscan Archipelago and the Alps. Gran Paradiso National Park (Italian: Parco nazionale del Gran Paradiso,French: Parc national du Grand-Paradis) is an Italian national park in the Graian Alps, between the Aosta Valley and Piedmont regions. 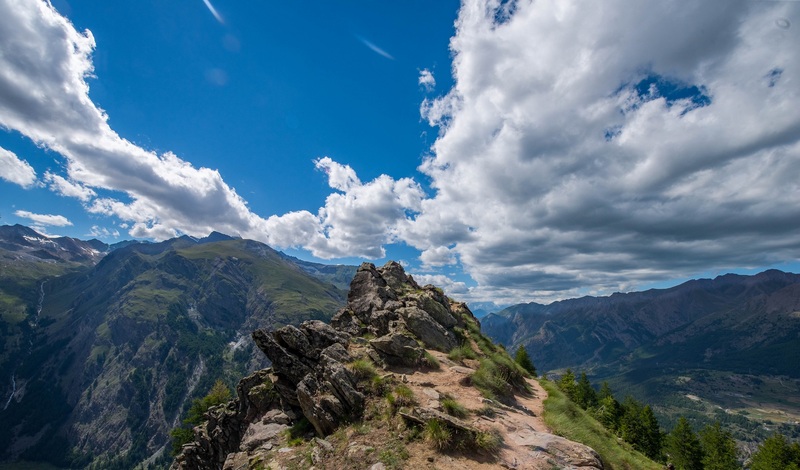 The park is named after Gran Paradiso mountain, which is located in the park, and is contiguous with the French Vanoise national park. 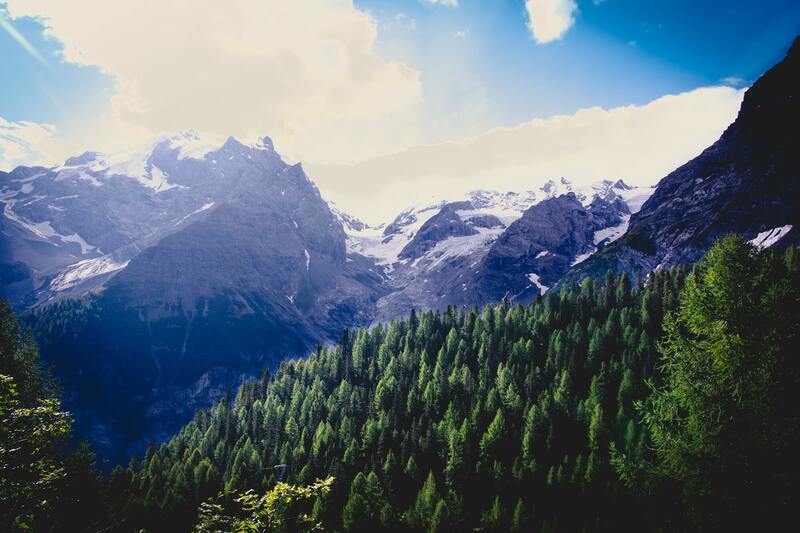 The land the park encompasses was initially protected in order to protect the Alpine ibex from poachers, as it was a personal hunting ground for king Victor Emmanuel II, but now also protects other species. In the early 19th century, due to hunting, the Alpine ibex survived in the Gran Paradiso and Vanoise area. Approximately 60 individual ibex survived, here. Ibex were intensively hunted, partly for sport, but also because their body parts were thought to have therapeutic properties:talismans were made from a small cross-shaped bone near the ibex's heart in order to protect against violent death. Due to the alarming decrease in the ibex population, Victor Emmanuel, soon to be King of Italy, declared the Royal Hunting Reserve of the Gran Paradiso in 1856. A protective guard was created for the ibex. Paths laid out for the ibex are still used today as part of 724 kilometres (450 mi) of marked trails and mule tracks. In 1920 Victor Emmanuel II's grandson King Victor Emmanuel III donated the park's original 21 square kilometres (5,189 acres), and the park was established in 1922. 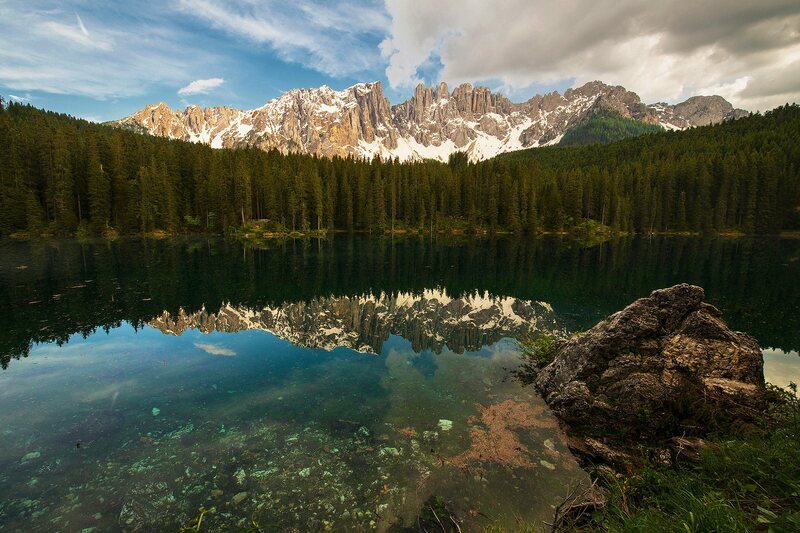 It was Italy's first national park. There were approximately 4,000 ibex in the park when it was protected. Despite the presence of the park, ibex were poached until 1945, when only 419 remained. Their protection increased, and there are now almost 4,000 in the park. The Aeolian Islands (Italian: Isole Eolie, pronounced [ˈiːzole eˈɔːlje], Sicilian: Ìsuli Eoli, Greek: Αιολίδες Νήσοι) are a volcanic archipelago in the Tyrrhenian Sea north of Sicily, named after the demigod of the winds Aeolus. The locals residing on the islands are known as Aeolians (Italian: Eoliani). The Aeolian Islands are a popular tourist destination in the summer, and attract up to 200,000 visitors annually. Because the largest island is Lipari, the islands are sometimes referred to as the Lipari Islands or Lipari group. 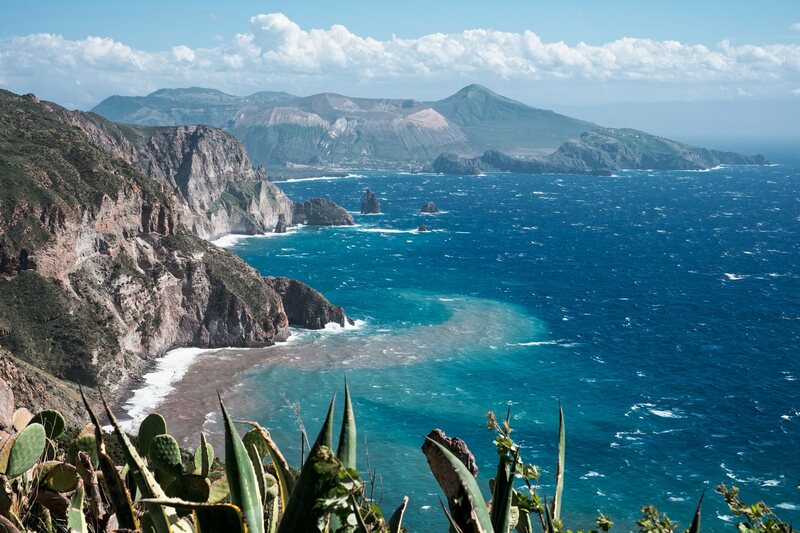 The other islands include Vulcano, Salina, Stromboli, Filicudi, Alicudi, Panarea and Basiluzzo. Lagazuoi is a mountain in the Dolomites of northern Italy, lying at an altitude of 2,835 metres (9,301 ft), about 18 kilometres (11 mi) southwest by road from Cortina d'Ampezzo in the Veneto Region. It is accessible by cable car and contains the Refugio Lagazuoi, a mountain refuge situated beyond the northwest corner of Cima del Lago. The mountain range is well known for its wartime tunnels. The Karersee (Italian: Lago di Carezza; German: Karersee) is a lake in the Dolomites in South Tyrol, Italy. It belongs to the municipality of Welschnofen. The Stelvio Pass (Italian: Passo dello Stelvio [ˈpasso ˈdello ˈstɛlvjo]; German: Stilfser Joch; [ˈʃtɪlfsɐ jɔx]) is a mountain pass in northern Italy, at an elevation of 2,757 m (9,045 ft) above sea level. It is the highest paved mountain pass in the Eastern Alps, and the second highest in the Alps, just 13 m (43 ft) below France's Col de l'Iseran (2,770 m (9,088 ft)). The pass is located in the Ortler Alps in Italy between Stilfs ("Stelvio" in Italian) in South Tyrol and Bormio in the province of Sondrio. It is about 75 km (47 mi) from Bolzano and a mere 200 m from the Swiss border. The Umbrail Pass runs northwards from the Stelvio's western ramp, and the "Three Languages Peak" (Dreisprachenspitze) above the pass is so named because this is where the Italian, German, and Romansh languages meet. The road connects the Valtellina with the mid Venosta valley (the Vinschgau) and Meran. Adjacent to the pass road there is a large summer skiing area. Important mountains nearby include Ortler, Thurwieserspitze, Trafoier Eiswand, de:Monte Scorluzzo, Piz Umbrail, and Piz Cotschen/Rötlspitz/Punta Rosa. 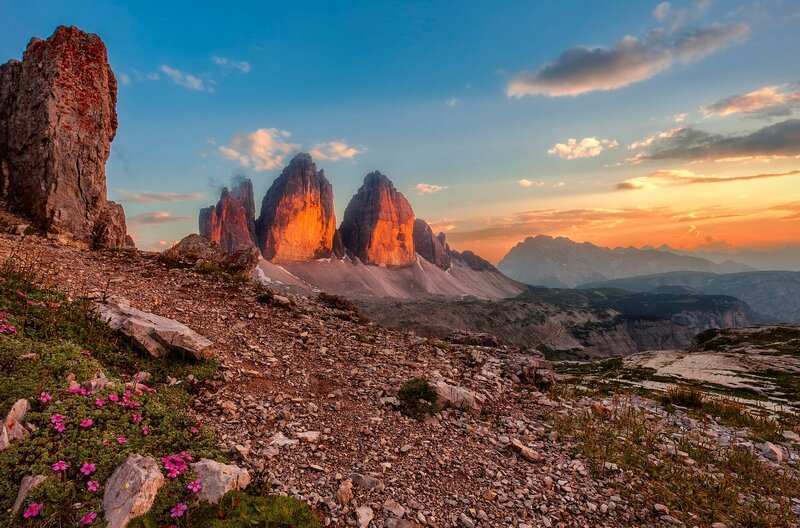 Piz Boè is the highest mountain of the Sella Group, a mountain-range in the Dolomites, Italy. It has an elevation of 3,152 metres (10,341 ft). 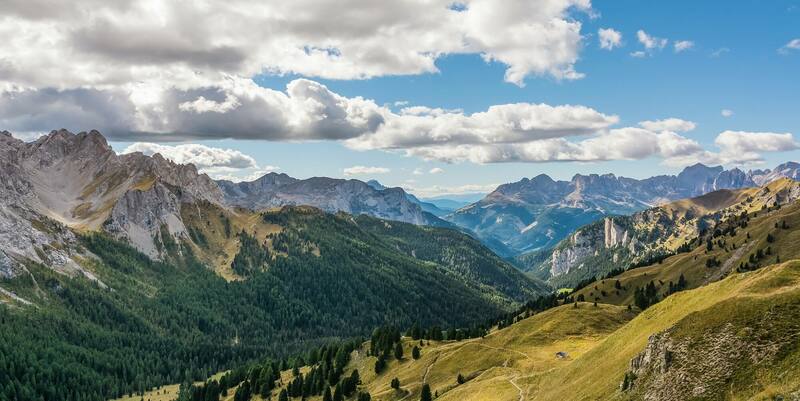 Located in the heart of the Dolomites, the mountain has a beautiful pyramid summit, and its popularity is increased as it thought of as the easiest 3000m summit to reach in the Dolomites, and can get overcrowded in the summer. It lies just above the Passo Pordoi. Due to its location, most of the major Dolomiten peaks are visible from its summit. The Fassa Valley (Ladin: Val de Fascia, Italian: Val di Fassa, German: Fassatal) is a valley in the Dolomites in Trentino, northern Italy. As an administrative valley community (Italian: Comunità di valle, German: Talgemeinschaft) of Trentino, it is called Region Comun General de Fascia. The valley is the home of the Ladin community in Trentino, which make up the majority of the population.